Cut the tops and bottoms off the lemons. Sit them upright on a cutting board on one end, and cut away the rest of the zest and pith from top to bottom with a sharp knife until only the juicy lemon remains. Now slice into rounds, then chop each round into about four, and place in a shallow dish. Sprinkle a liberal amount of salt over them, then scatter the chopped red chilies over top and pour olive oil over everything. I’m not sure how much exactly – but just remember, the lemon and oil combine to make your dressing, so pour until you think there is enough. You can always adjust later. While the lemons are left to steep, heat your grill on med-high. Season your steak with salt and pepper or grill seasoning and grill until med-rare (or how you like it). That’s about 5 minutes on each side. Let your steak rest before you cut into it. While it’s resting, taste and see if you think the dressing needs augmenting. If it does add more oil, salt, or another squeeze of lemon as you feel it needs. Divide your lettuce among two plates. Decant most of the steeped lemons and their oily juices over top of the two plates and mix them up nicely. When the steak has rested for 5-10 minutes, slice as thin as you can against the grain. Divide the steak up between the two salads, making sure to get all the red juices from the meat as well. Finish by shaving a liberal amount of Parmesan peels over the top with a vegetable peeler. Is is any wonder Steve and I go mad over this salad? 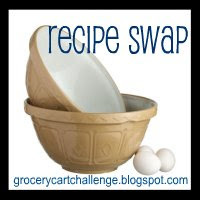 This recipe is being submitted to this weeks Grocery Cart Challenge Recipe Swap. Each week participants upload links to their favorite recipes that week. I will definitely check out foodandfizz.com...thanks for letting me know about it!